This was an amazing adventure! One of my besties from Rutgers came to visit me after volunteering at a school in Equador through her psychology post graduate program. In Lima we got to do a free tour of Lima, and a Lima pub crawl. 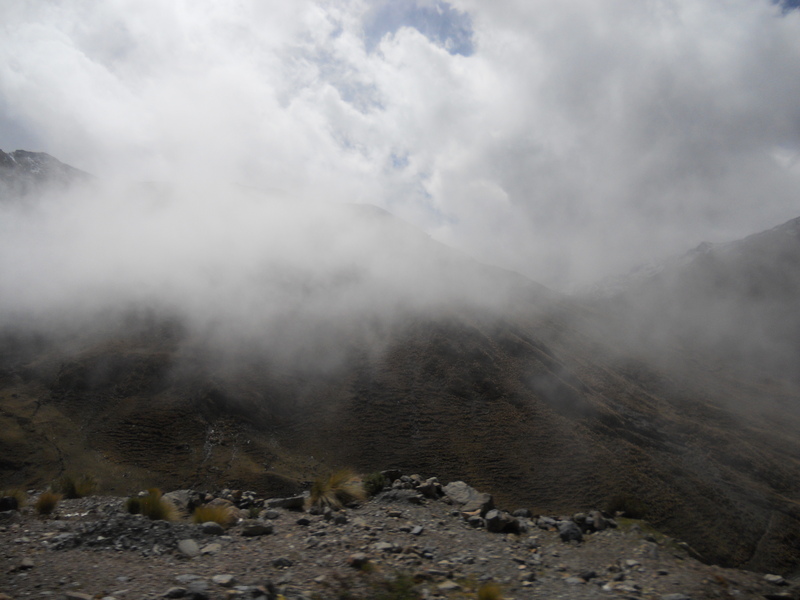 We flew to Cusco and the next morning got a ride to Santa Maria, stayed at Yellow river, went to Aguas Calientes, went to Manchu Pichu, got lost in-between two mountains, and made it back to Lima safe and sound. Well that’s the short of it here’s the longer version. When Keisha arrived to Lima she was only going to be here for a few days so I had her off and running about an hour after she arrived to our apartment. Of course I let her get take her first hot shower that she had in a month. Trust me this is a great thing after staying in hostels and at houses that don’t have truly hot water. First we grabbed a quick bite at La Lucha Sangucheria in Miraflores my FAVORITE sangucheria here. I love their chicharrone sandwich! Its a pork sandwich with, salsa criolla (onions, lime, and sometimes peppers), and slices of camote (sweet potatoes). (I’m going to go get one for lunch so I can add a photo lol). Then we headed off to the Lucid Lima Free Walking Tour http://www.lucidlimafreetour.com/ of downtown Lima; which pretty much tells the story of how the Spaniards attacked and conquered Peru from the Incas, and takes you through the city to see what the Spaniards built. For the most part in Lima the Spaniards destroyed everything Inca. 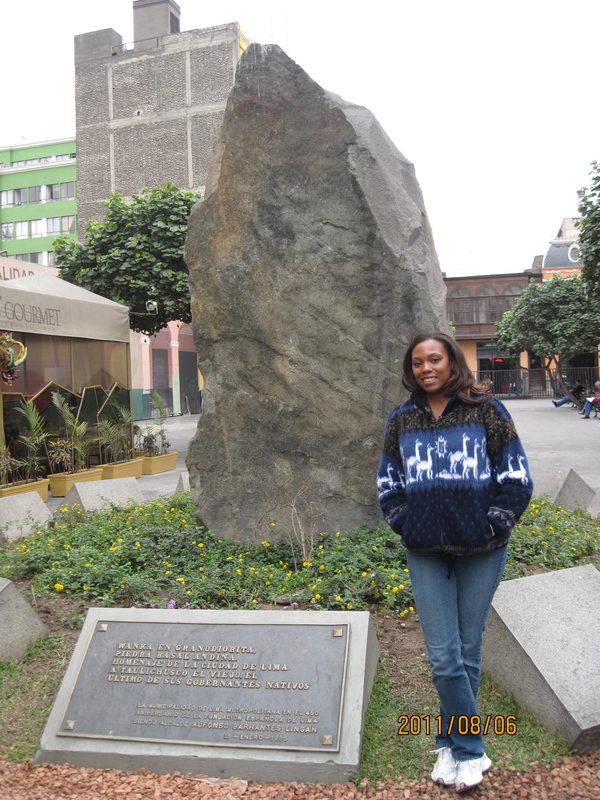 There is one stone monument left that is a reminder that they will never leave, and the government has moved the statue of the infamous conqueror Francisco Pizarro to the farthest corner of downtown Lima that you wouldn’t be able to find unless someone guided you there. I’ve been told that it was also moved because people constantly spray paint it with graffiti. The next afternoon we got up and headed to this little market around the corner from my apartment that has a great seafood restaurant in the back I had fish and shrimp – it was muy rico! 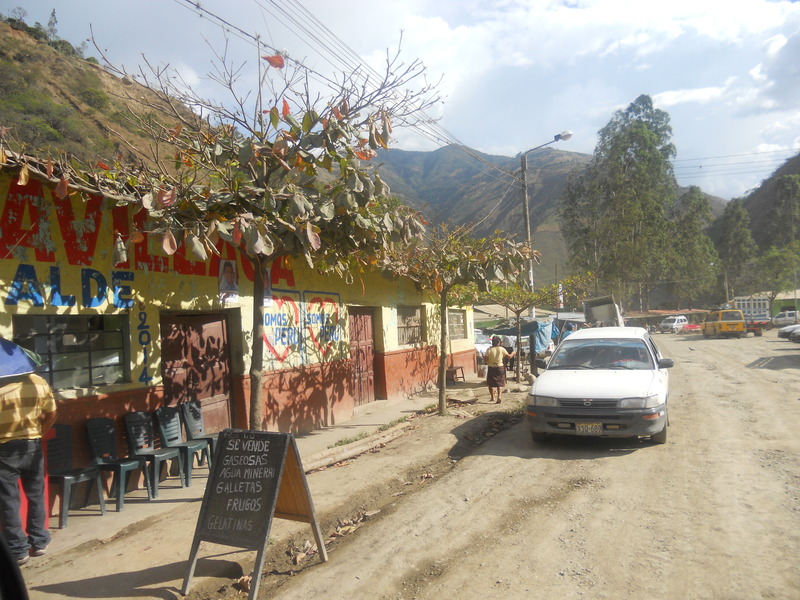 I’m also told that they have great ceviche there – sounds like I need to make a trip soon. 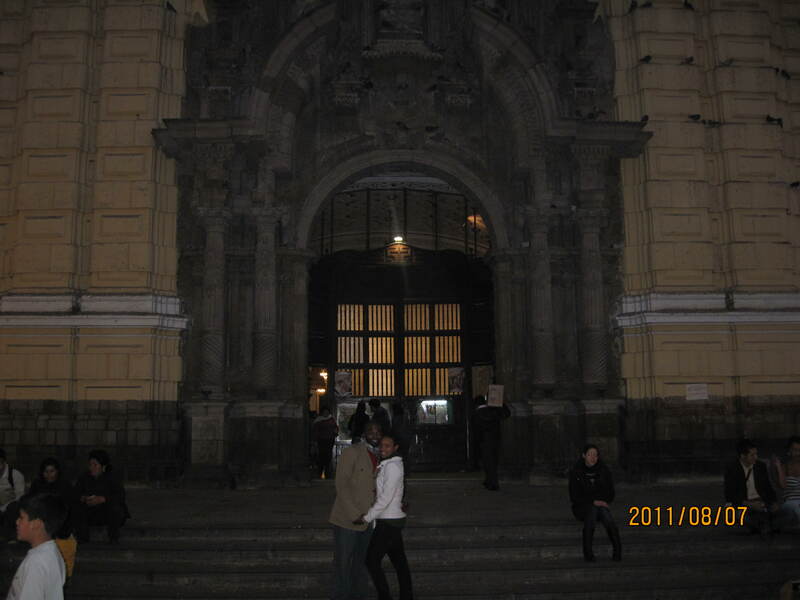 We also walked around Barranco then went back to downtown Lima to see the catacombs in the San Francisco Church. That was a great tour you can’t take pictures so here’s my best description. First you take a tour of the church which has the second oldest library in South America. It displays two very large choir books and the entire room has beautifully carved mahogany wood. It looks like something out of Harry Potter. The entire church is very ornate especially the alter and the choir loft. Surprisingly one of the chapels has had new art added to it – a large mural on the ceiling. It was very interesting to see the combination of old and new. Then we went down to the catacombs which is a very tight underground grave of skeletons. There is a well where the bones have been placed into a creepy circular design. They said that the scientists that were cataloging the bones did this. Here is a link of pictures from google: photos We were also told that this church was once completely covered in gold or silver (sorry I can’t remember), and that millions of African slaves and Incans died mining for the ever so precious metal – enough people to circle the world twice. The next day we were off to Cusco. We stayed at Edith’s Casita again and this time it wasn’t too cold. I have learned that being in a high altitude makes me incredibly gassy (uncomfortable and doesn’t smell so great). 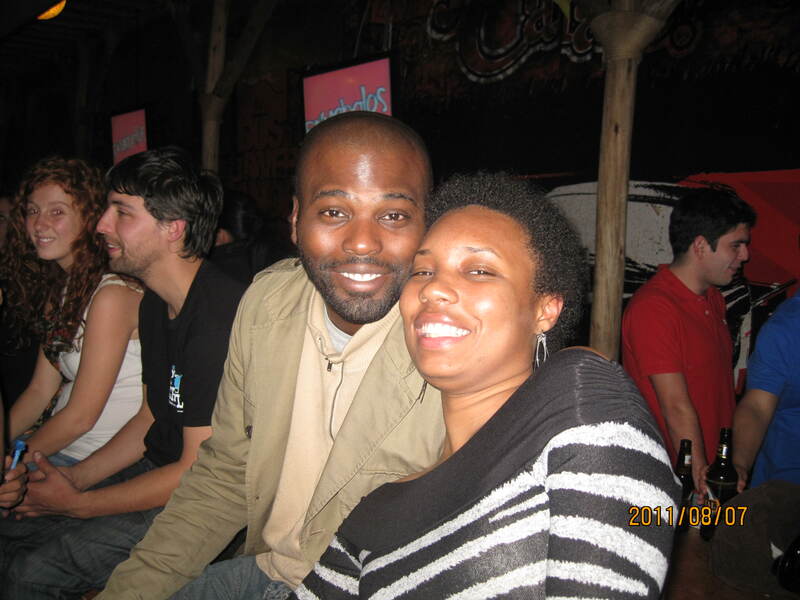 We went to my favorite restaurant in Cusco “Inka Grill”, met mi amiga Sonia at my favorite posteria in Cusco “La Bondiet” (if you’re in Cusco this is a great place to go warm up and have an in expensive cup of hot coco), and ended the night dancing at Mythology. We got up bright and early the next morning, went grocery shopping for snacks then took a cab to grab a van to Santa Maria. From there we had a 5 hour van ride with 10 people for 25 soles. It was an experience not bad but not one that I need to do again. I can’t complain though it was only 25 soles. However, I still would recommend it, but maybe in a private car or cab. The ride is absolutely breath-taking. 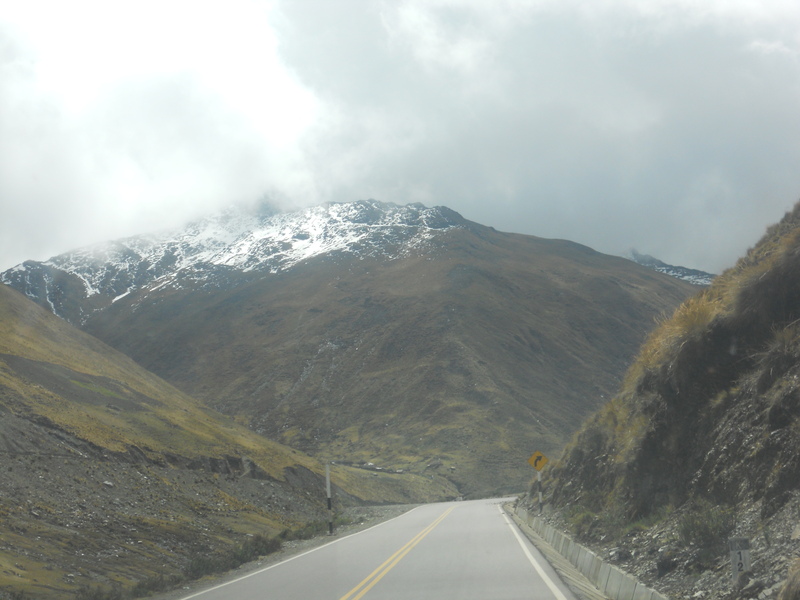 We started off riding through the Sacred Valley, and stop for a snack and the lou in Urubamba, rode through Ollantaytambo and then all of a sudden we were driving up a snow-capped mountain. Once we reached the top of the mountain in the clouds and began our descent down the other side it completely changed to a lush tropical landscape. Have you ever seen the tv show “Off the Map“? http://abc.go.com/shows/off-the-map This is where we were – completely off the map without a cell phone signal. 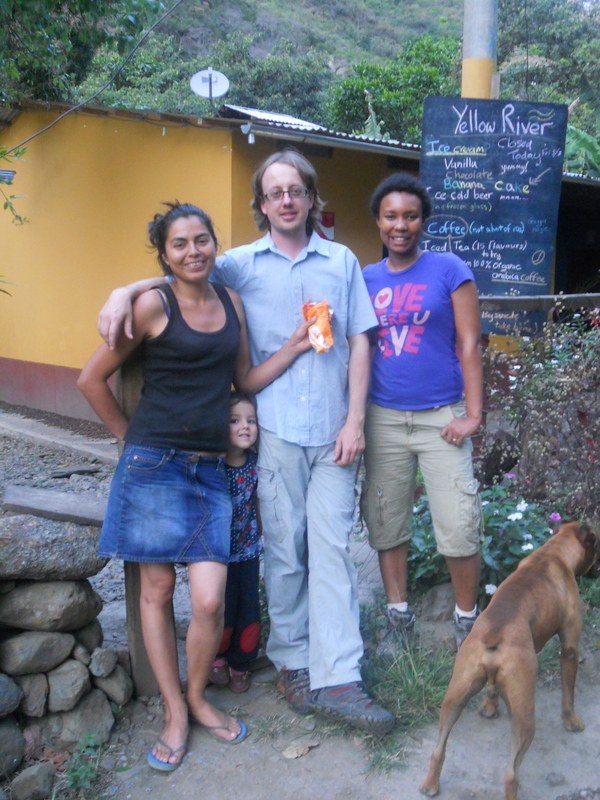 We arrived in Santa Maria exactly 5 hours later at 3pm and Andrew one of the owners of Yellow River (or Quello Mayo) http://quellomayo.co.uk/ was promptly there to pick us up. We jumped in his pick-up truck and winded down the side of a mountain on a very narrow road (close your eyes if you are afraid of heights) and ended in his family piece of paradise in Peru. Lunch was fantastic! 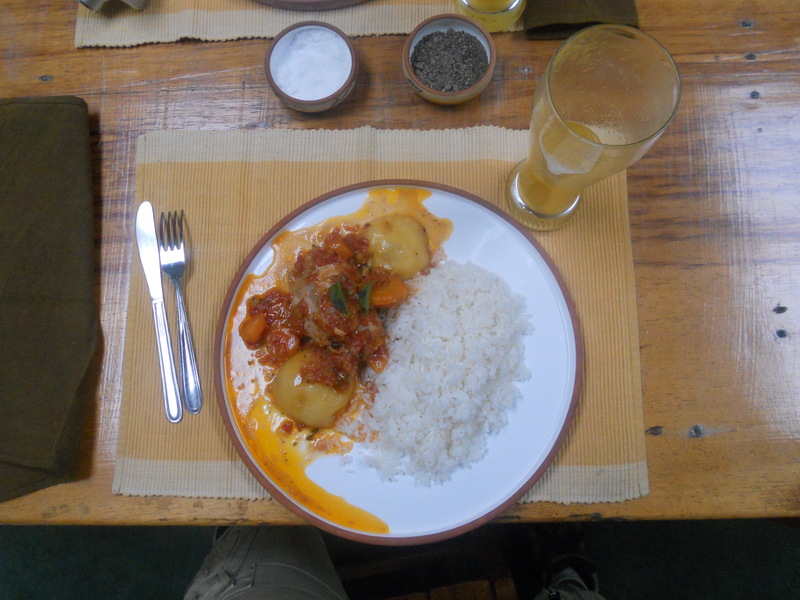 First fried yuca and yuca, then soup, then stewed chicken and a tall glass of juice. =) All very yumtastic!! !